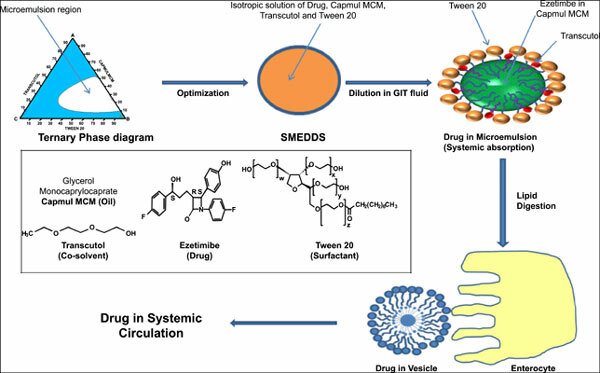 Background and Objective: In the present study, a self-micro emulsifying drug delivery system (SMEDDS) has been developed and optimized to enhance solubility and bioavailability of poorly water soluble drug ezetimibe. Methods: Phase solubility studies and emulsification tests were performed for selection of a suitable oil, surfactant, and co-solvent. Ternary phase diagram was constructed to find out range of oil, surfactant and co-solvent required for microemulsion formation. A three-factor, two level, mixture design of experiments was used to optimize the concentration of components for SMEDDS formulation for achieving desirable physicochemical properties such as small globule size (<100nm) and high dissolution (more than 85% of drug released within 15 minutes). Lipolysis of optimized ezetimibe SMEDDS formulation by pancreatic lipase was done to investigate the effect on solubilizing capacity of dispersed colloid in aqueous phase. Pharmacodynamic study on hyperlipidaemic rat models was done to investigate the bioavailability of optimized ezetimibe SMEDDS formulation in comparison to pure drug. Results: The optimized ezetimibe loaded SMEDDS formulation containing 10.0% capmul MCM (oil), 70.0% tween 20 (surfactant) and 20.0% transcutol (co-solvent) offered smallest globule size (16.3 nm) and maximum drug release (97.8% in 15 minutes). Lipolysis has shown that the nature of colloidal species changed during lipolysis process does not affect solubilizing capacity of dispersed colloid. Pharmacodynamic investigation reveals that optimized formulation significantly reduced serum lipid levels when compared with ezetimibe drug and hence indicating improved bioavailability. Conclusion: The result of this study suggested that ezetimibe SMEDDS formulation developed using mixture design of experiment could potentially be used for improving the solubility and bioavailability of poorly water-soluble drugs. Bioavailability, design of experiment, ezetimibe, lipolysis, self micro emulsifying, drug delivery system.